DALLAS, Aug 16, 2012/ — Marni… known for its modern and whimsical creations that border on sweet. 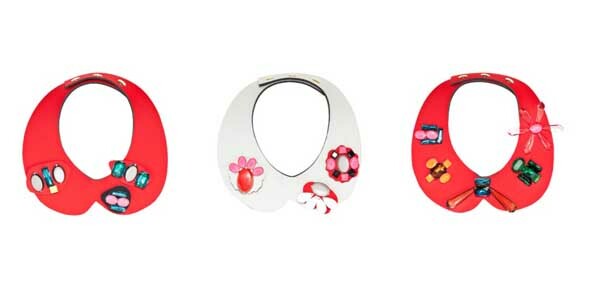 The COLLARS collection, an important focus in the MARNI WINTER EDITION 2012 is the epitome of the label’s whimsy. Neoprene collars in black, white and red are adorned by geometrical applications with stones or with bows creating visual and tactile accumulations. The black neoprene collars are embellished by brooches in resin in the collection’s prints, while the round collars in acetate with lenticular technique carry people patterns or geometric gravity patterns. So, is it a whimsical statement or is there some sexual connotation. The shapes of the collars after all has some sexual allusions… what is begging to be asked is, what does suit your fancy? The collars represent the taste for sweet decoration and clash harmonically in the typical Marni way.